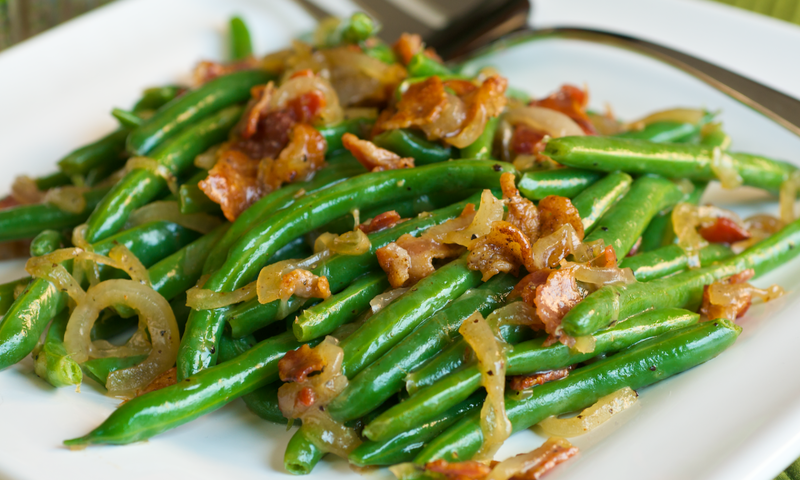 An easy side dish featuring a common vegetable, green beans. Blanch green beans by filling a large bowl with ice and cold water leaving room for green beans. Bring a large saucepan full of water to a boil and add green beans and a good helping of salt. Cook for 1-2 minutes, drain the beans and plunge them into the bowl of ice water. Let them cool, drain and dry well. Cook bacon until crisp. Remove with a slotted spoon, and drain on paper towels, reserving 2 Tbsp. drippings in skillet. Add olive oil to the pan with the bacon drippings then add the quartered shallots and sauté until browned. Add the vinegar, stir well, then add the green beans and toss until coated with oil. Cook for another minute then season with salt and pepper and toss with bacon, serve hot.